Inspired by Savannah: New Valentine's Day Daniel Tiger's Neighborhood Episode Premieres Monday, 2/9 on PBS KIDS! 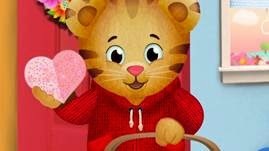 New Valentine's Day Daniel Tiger's Neighborhood Episode Premieres Monday, 2/9 on PBS KIDS! This year, celebrate Valentine’s Day in the Neighborhood of Make-Believe! Snuggle up with your young valentines and tune-in to a very special Valentine’s Day episode of Daniel Tiger’s Neighborhood, premiering Monday, February 9, on PBS KIDS (check local listings) and re-airing all week long. The heartwarming new episode of the top-rated series for preschoolers from The Fred Rogers Company helps reinforce Fred Rogers’ enduring messages of love and acceptance for all little tigers. Grandpere is coming to visit on Love Day. How can Daniel find a way to show how much he loves his grandfather? With a treasure hunt, that’s how! Daniel hides little hearts all over the house for Grandpere to find…that is, unless little Margaret finds them all first! I'll have to record this for my grandsons! Thanks for the heads up! We'll have to watch this one it looks super cute.